Alfred Priess A/S and EKTOS A/S have since 2015 been collaborating on developing a controller for Priess’ product series of intelligent solar cell street lighting columns. The product has been refined in collaboration with Priess, their clients, and EKTOS. Two of the most important improvements that EKTOS has implemented in the latest version of the controller are remote access through a software module from Nabto and the addition of a GSM module. The new possibilities for getting access have resulted in new ways of using the product. 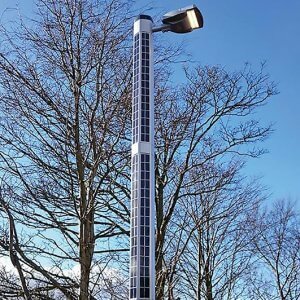 One of the intelligent features of the Priess’s solar cell street lighting columns is that you can manage the lighting columns through WiFi connection which minimizes the number of physical visits to the columns, for example, when support is required. However, due to firewalls, one cannot “just” log on to a column from one’s desktop without involving the IT administrator of the local network. For Priess and for many of their clients this necessity has become an annoying barrier. Along with the Nabto module, Priess has also chosen to implement a GSM module in the latest version of the controller in order to make it possible to reach the lighting columns that are located where there is no WiFi coverage. This could be long a highway outside of Abu Dhabi or on a parking lot in southern Sweden. Earlier it was possible to add a SIM card in each controller but this implied buying a subscription for each lighting column. If you had 500 lighting columns it would be a costly solution. Now, because we have developed the controller with a local Mesh network and because we have implemented the GSM networks, it is possible to connect to a larger group of lighting columns on one SIM card. In order to make the system even better we are now implementing an alarm that notifies Priess and their clients before a problem occurs. The alarm could for example go off before the battery in a lighting column runs out of power if the whether has been cloudy for a longer period. “We optimize our product based on our own experience or requests from our clients. When I have approached our project manager at EKTOS, with whom I have worked closely right from the start, he always came up with really good ideas for solutions,” Ole Søndergård, product manager at Alfred Priess A/S says and continues: “EKTOS has some super-skilled people in Ukraine who understand every little detail of our product, which means that they can evaluate what is possible to do. We have managed to develop some incredibly reliable controllers where power conversion as well as advanced controlling and communication work well together in the several thousands of units we have sold by now. Neither language nor distance to Ukraine is an issue, and I expect that we will continue our collaboration far into the future,” Ole Søndergård concludes. At EKTOS, we are looking forward to further optimizing the controllers for the solar cell lighting columns. New technology is constantly being developed so the limits for how intelligent they can become are constantly moving. We love being a part of the latest developments and applying the latest technology in functional IoT-solutions so we can continue to be competent partners for our clients.